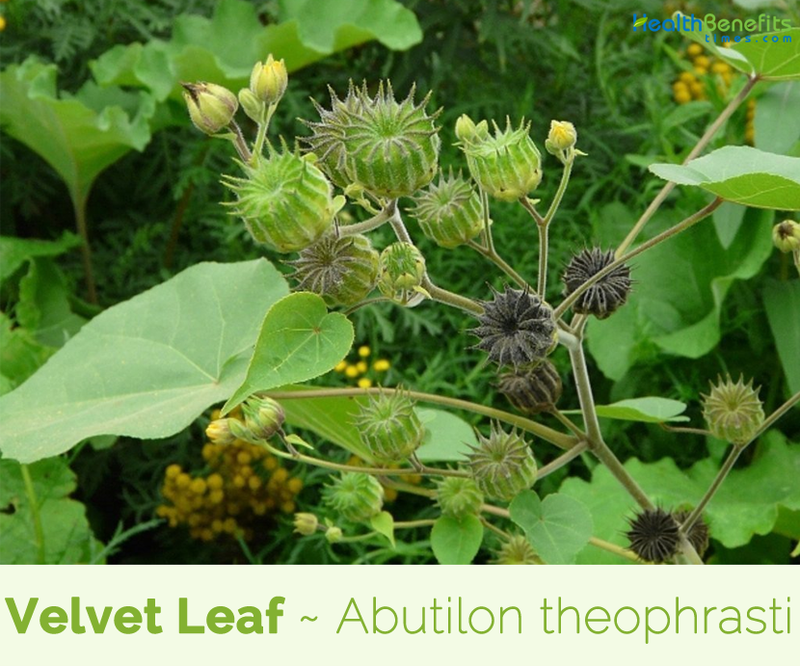 Abutilon theophrasti, Velvet leaf or Chinese jute is an annual plant of the genus Abutilon Mill. belonging to Malvaceae (Mallow family). The plant is native to Mediterranean or to a wider area including temperate Asian and European countries. It is cultivated and occasionally naturalized in Europe, Asia, America and Australia. In Malesia only recorded in Indonesia (Sumatra, Java, Sumbawa and Sulawesi). 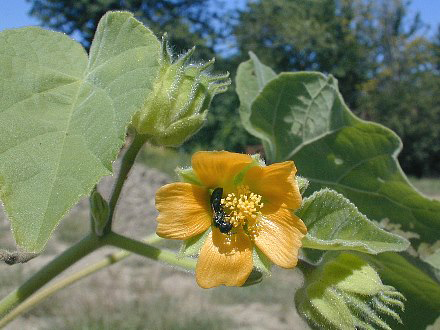 The plant has got several common names including Abutilon-hemp, Abutilon hemp, American jute, American velvet leaf, Butter print, Butter print velvetleaf, Butterweed, China-jute, Ching ma jute, Ching ma lantern, Cotton weed, Flower of an hour, Indian hemp, Indian-mallow, King ma jute, Pie maker, Swamp Chinese lantern, Tientsin-jute, Velvetleaf, Velvet weed, Velvet-leaved jute, Wild cotton, Button weed, Velvetleaf Indian mallow and Velvet leaf abutilon. 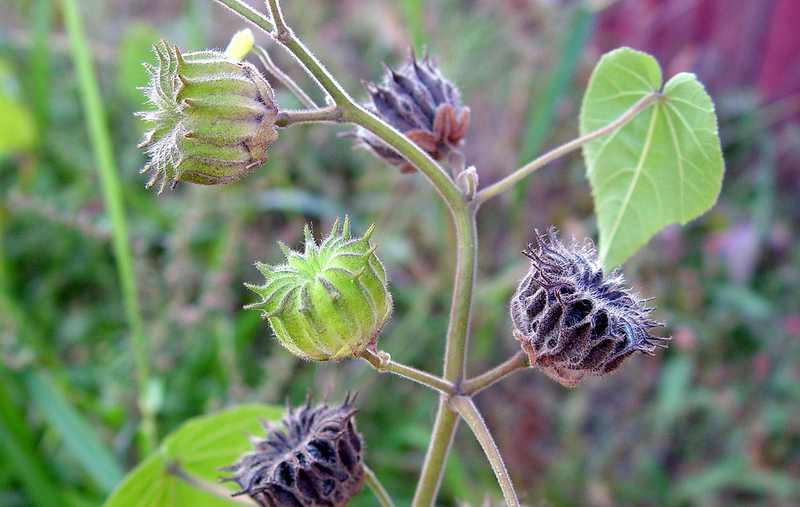 Roots, seeds and leaves of abutilon theophrasti are considered important herbs in traditional Chinese medicine (CTM). Its common name comes from the soft leaves which are covered in short hairs, making a velvety feel. 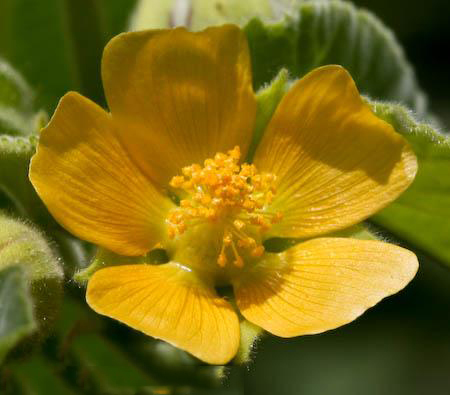 Also known as butter print and China jute, A. theophrasti comes originally from India and tropical Asia and is in the mallow family (Malvaceae). 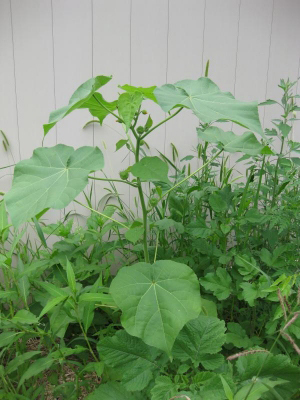 It is a rather tall and lanky plant with large leaves. It is easy to identify because there is really nothing else in our area that resembles it. It is considered to be a noxious weed in several states, including Colorado, Iowa, Oregon and Washington. Velvet Leaf is an erect, herbaceous, annual sub shrub-like herb that grows up to 8 feet tall, but most plants are in the 2-4 foot tall range. 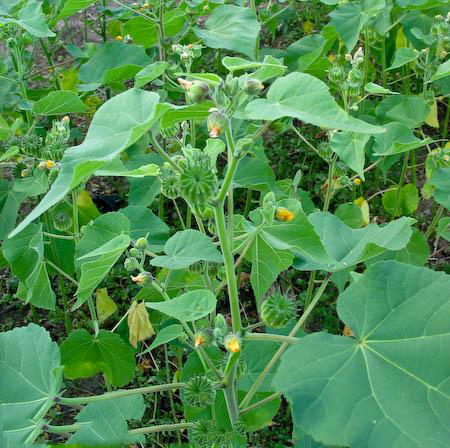 The plant is found growing in wasteland, vacant lots, gardens and cultivated fields, especially maize and soybean fields, along fence rows, abandoned fields, construction sites, roadsides, ditches, hillside slopes, riverbanks, disturbed areas, and crop fields. Normally the plant prefers sandy, loamy and clay soils and requires well-drained soil. The plant prefers acid, neutral and basic soils and can grow in very alkaline soil. It requires dry or moist soil. The plant has erect stems that are much branched in the upper part. The surface of the stem is smooth with short velvety hairs. The stem and twigs are covered with fine hairs. 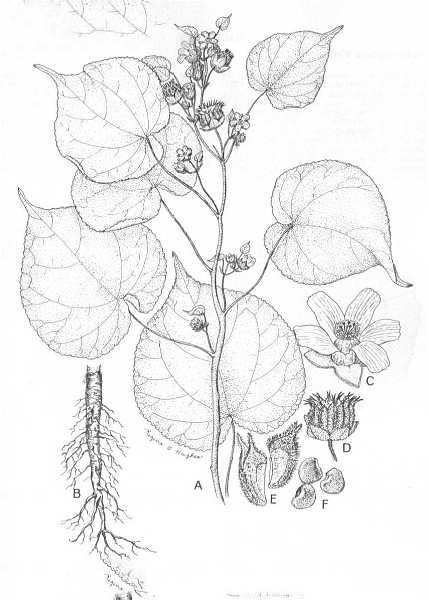 Sixteen to sixty-three leaves per plant are alternately produced with long petioles, and a broadly heart-shaped blade. 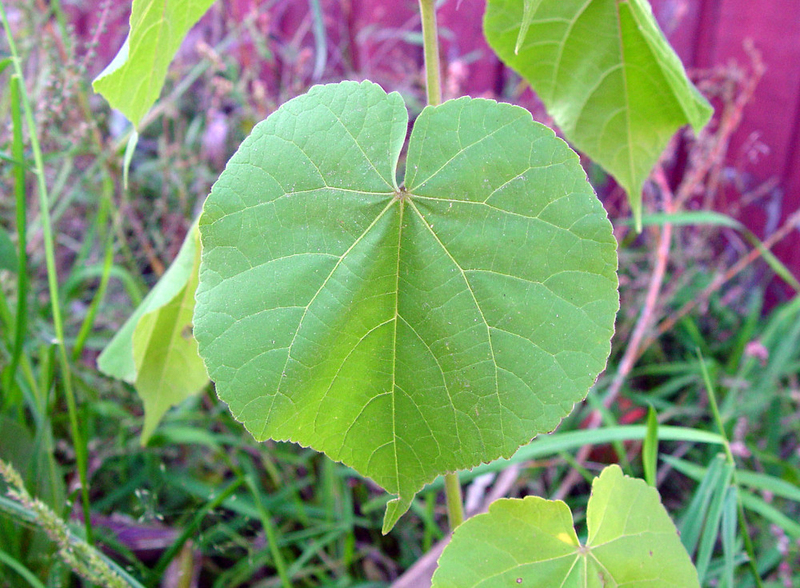 The width of the leaf blade is 7-20 cm and the leaf area ranges from 300 to 470 cm. it has a distinct odor when crushed. 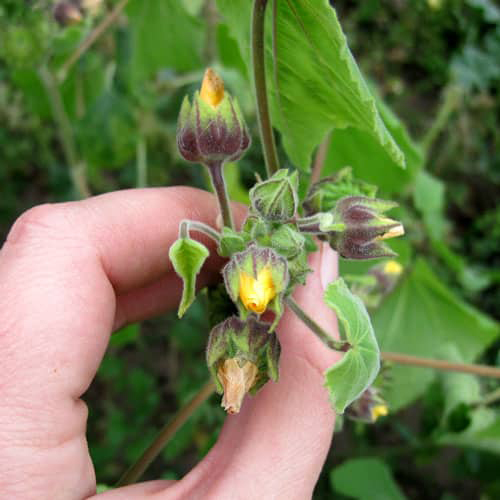 All parts of the plants except the petals are covered with short, dense velvety hairs. Short-stalked flowers are borne singly or in clusters at the leaf axils. The mellow, orange-yellow flowers are about ½ to ¾ inch across with 5 squarish petals and a dense cluster of orange colored stamens and styles at the center. 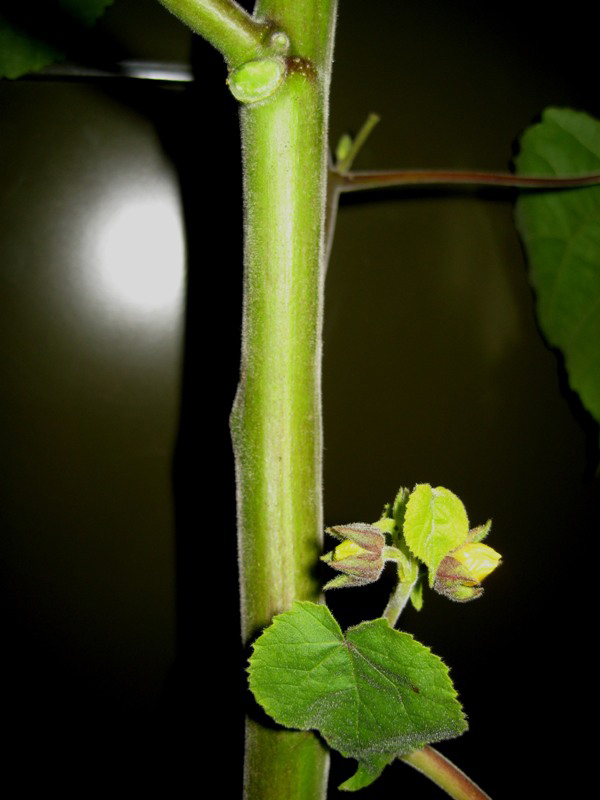 Calyx has five lance-like lobes about ¾ the length of the petals. The calyx surfaces and flower stalks are densely hairy. Flowering normally takes place from July to August. 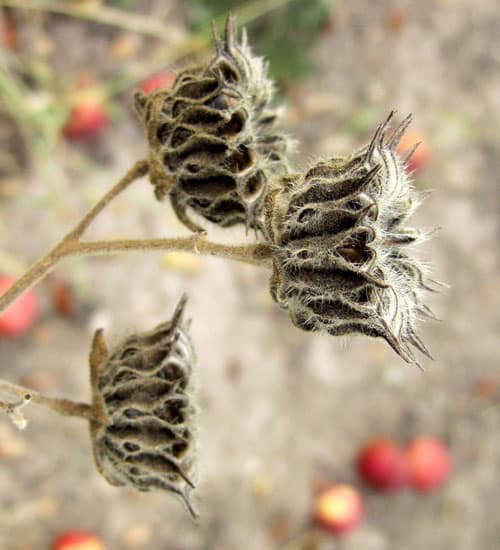 Fertile flowers are followed by thick, round button-like seed pods or capsules, made up of 12 to 15 seed compartments (carpels) about 1.3-2.5 cm long and 2.5 cm wide, each with a sharp spiny beak at its outer tip, and densely covered in velvety hairs. Each compartment contains up to 15 seeds. A mature plant can produce 17,000 seeds. 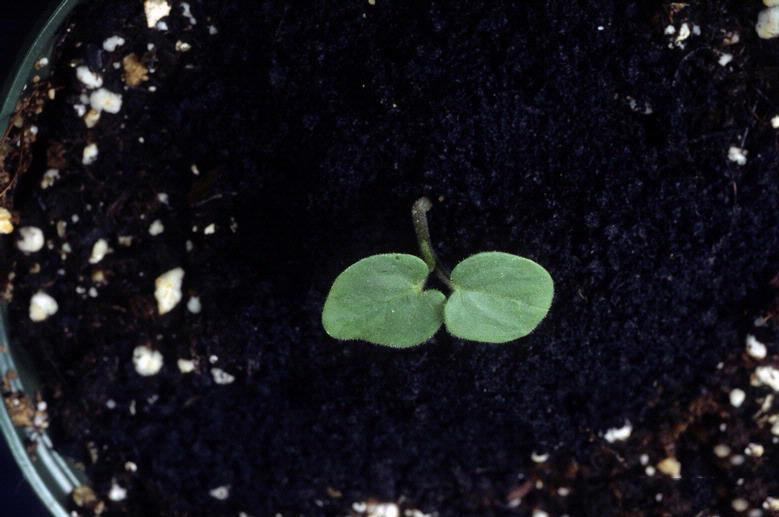 Seeds can remain viable in the soil for over 50 years. 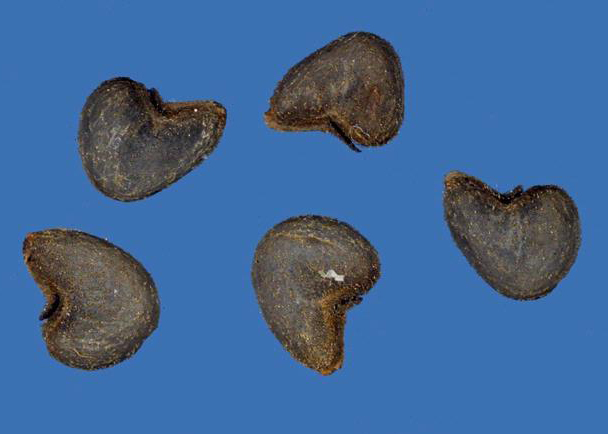 Seeds are kidney-shaped to nearly triangular in outline, prominently notched along margin where hilum occurs, compressed (thickened along the margin opposite the hilum and usually with a rounded, concave area on each face, creating a bilobed cross-section), 2- 4 mm long, 2.2–3.2 mm wide and 1.5–1.9 mm thick. Surface is dull, purplish-gray to brown or black, minutely honeycombed, typically sparsely covered (thicker around notch) with tiny branched hairs with orangish bases. It is used in the treatment of dysentery and opacity of the cornea. Leaves consist of 0.01% rutin and are used as a demulcent. Tea made from the dried leaves is used in the treatment of dysentery and fevers. 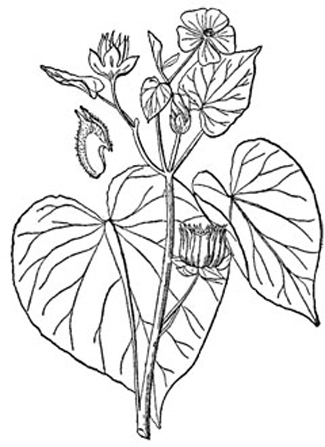 Poultice of the leaves is applied to ulcers. The bark is astringent and diuretic. Tea made from the dried root is used in the treatment of dysentery and urinary incontinence. It is also used to treat fevers. Seed is powdered and eaten in the treatment of dysentery, stomach-aches etc. It is demulcent, diuretic, emollient, laxative and stomachic. It is an herbal treatment for Fever and Diarrhea. It is a good herbal treatment with the ophthalmic attribute. It helps in curing Eye related ailments like Cataract. It is effective in curing digestive ailments and helps in increasing one’s Appetite. It is also helpful in treating Stomach pain and Loose Motions. It acts an astringent; therefore it is effective in ceasing the oozing of blood from cuts. It softens the skin and heals cuts and bruises. It has sanitizing properties, helping in keeping things clean and hygienic. It is an effective pain killer. It is beneficial in relieving inflammation and swelling. It is a good herbal remedy for improving the urine flow and bowel movement. Thus, it helps in proper expulsion of toxins from the human body. Seeds can be consumed raw or cooked. 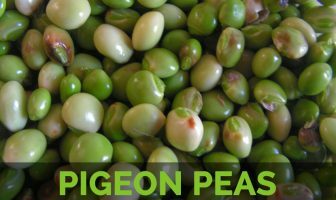 They can be eaten raw when they are under-ripe. Ripe seed is dried and ground into a powder then used in soups, bread etc. Fiber obtained from the stems is used as a jute substitute. It is coarse but flexible and strong. It is also used in rope-making. Fiber is also used for making paper; the stems are harvested in the summer, the leaves removed and the stems steamed in order to remove the fibers. 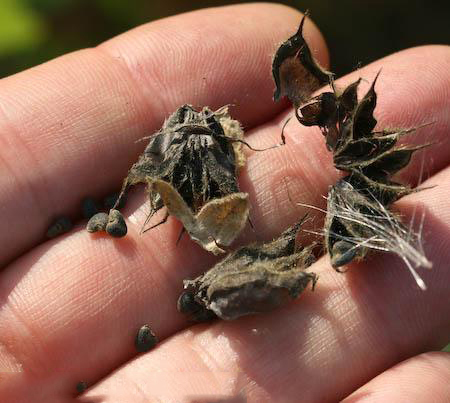 Seeds contain about 19% of semi-drying oil. Bast fiber of China Jute was used to make rope, cordage, bags, coarse cloth, fishing nets and paper stock, and for caulking boats, in China since 2000 B.C. Velvet Leaf is also used in paper making and for caulking. In a pinch, the soft leaves can be used as a toilet paper substitute. It is a source of semi-wet oil which is used in making soaps, polish. Each plant produces 700 to 17,000 viable seeds. 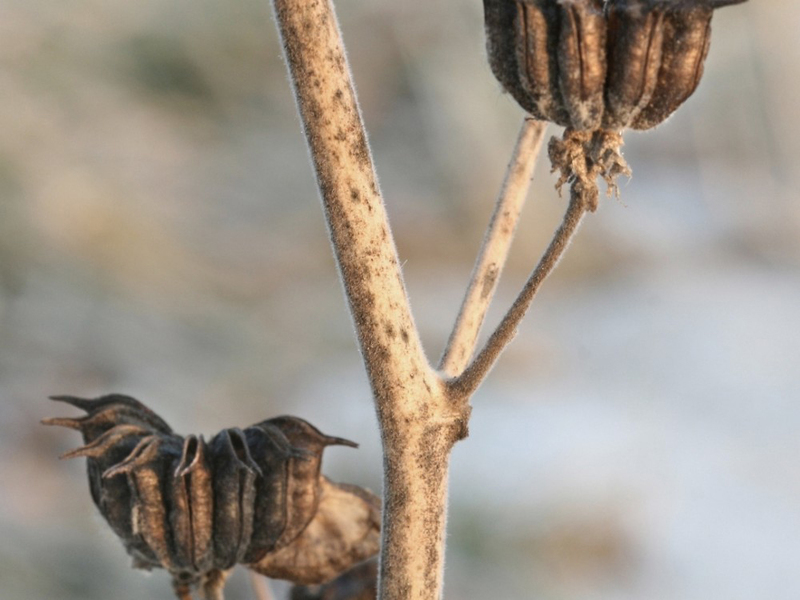 Seeds can remain viable in soil for over 50 years. Sato et al. (2000) noted that a living mulch of Italian ryegrass reduced yield loss in the late spring sowing of maize in Japan. Lueschen and Andersen recommended that intensive tillage could decrease the seed population. Hand-pulling can be effective on young seedlings but is impractical in large fields of maize, soybeans and cotton in intensive agriculture. Machine intertillage in row crops is also effective only in relatively small fields. Effective herbicides include metribuzin, atrazine, 2, 4-D, bentazone, bromoxynil, cyanazine, dicamba, linuron, halosulfuron-methyl and fluthiacet-methyl. However, triazine-resistant biotypes of A. theophrasti have been reported in Maryland, Wisconsin and Minnesota, USA. Niesthrea lousianica, Fusarium lateritium and Colletotrichum coccodes have been considered as potential agents for biological control or mycoherbicides. In field tests, pre-emergence applications of F. lateritium in granular formulation gave 46 and 35% control of A. theophrasti in 1982 and 1983, respectively. 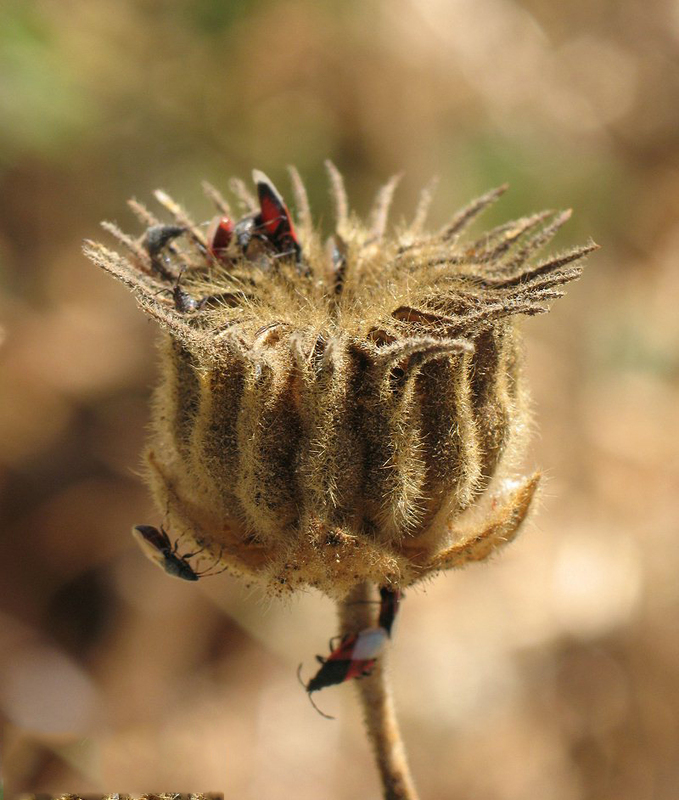 Because A. theophrasti germinates throughout the season, diverse practices are required to sustain effective control of A. theophrasti infestations, including crop rotation, multiple herbicide applications and cultivations. 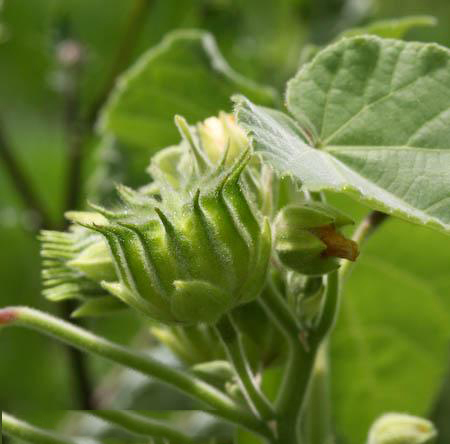 Bussan and Boerboom modeled the integrated management of A. theophrasti in a maize-soybean rotation. Wilt disease or mechanical treatment by inter-row cultivation could reduce the herbicide rate needed to reduce the A. theophrasti seed bank only when initial seed bank density was low. Do not consume during pregnancy and while breast feeding. Person with loose stool problem due to spleen deficiency or cold should take the herb in consultation with a doctor. Excess intake may cause Hallucinations, speech disorders, diplopia and mild excitation. Fruit Color Initially light green, but rather quickly turns brown or black as they matures. 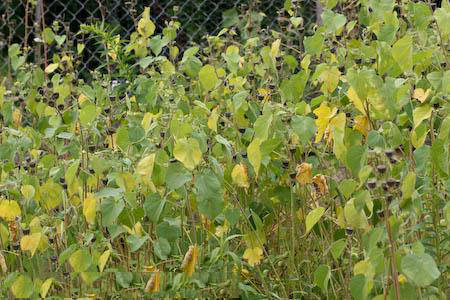 Mature capsules differ in color between plant types. Sida abutilifolia Moench ex Steud. Sida tiliifolia Fisch. ex DC.